See also: Information on sataw beans (sadtaw). 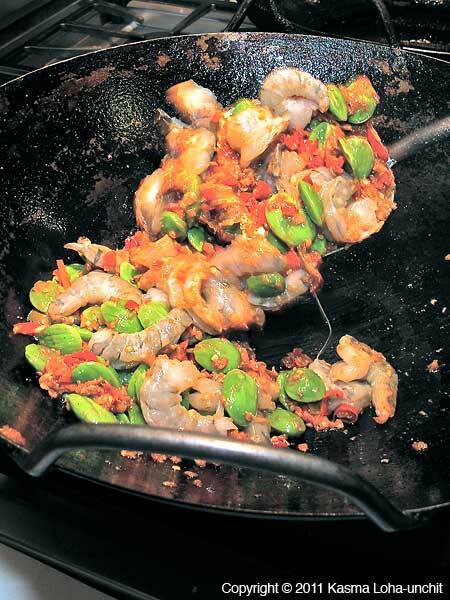 Pound the garlic, both kinds of chopped chillies and shrimp paste together with a mortar and pestle to make a coarse paste. Heat a wok over high heat until it is begins to smoke. Swirl in the oil to coat surface and wait a few seconds for it to heat. Add the chilli paste and sauté until fragrant. Add the sadtaw or fava beans. Stir-fry 20-30 seconds. Follow with the shrimp and continue to stir-fry over high heat until most of the shrimp have started to turn pink. Season to taste with lime juice, palm sugar and fish sauce, and add the green peppercorn sprigs, kaffir lime leaves, pepper slivers and coconut cream. Stir well and when shrimp are cooked through, transfer to a serving plate. Serves 3-4 with rice and other dishes in a shared family-style meal. Sadtaw is a prized vegetable in the southern region of Thailand. It actually is not a vegetable, but the young beanlike seeds of a large tree, carried in long, flat and wavy, over-sized, bright green seedpods. Each seedpod yields only a small handful of seeds. Bunches of these colorful seedpods can be seen hanging from stalls in just about every open-air marketplace in the southern provinces, as well as fruit and vegetable stands along major roadsides. Because it is fairly expensive and a delicacy, it is used sparingly, even in the dishes in which it is featured. 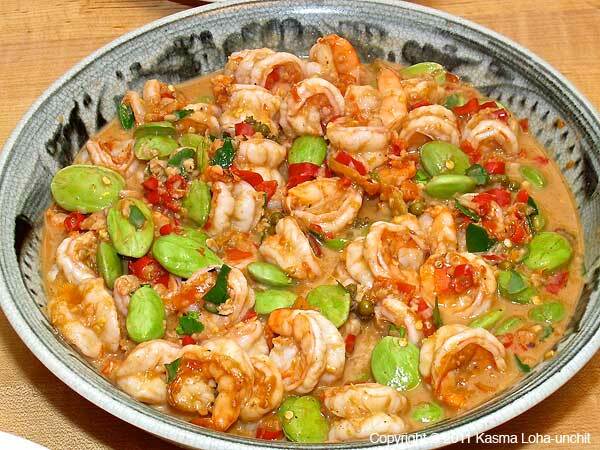 Only a few bites of the tasty seeds with shrimp in a spicy sauce are enough to satisfy a craving. The sauce in this recipe is a truly southern combination of flavors – very pungent and meant to be eaten with plenty of rice. I have suggested substituting the sadtaw with fava beans because they are approximately the same size and color with a slight bitter taste. Lima beans and broad beans may also be used; adjust the cooking times as needed to tenderize them. Kasma teaches this recipe in the Evening Series Advanced Set C-3. *Because the Thai language has its own script, there are different ways of transliterating Thai into English. The more phonetic version is Gkung Pad Sadtaw; the more usual spelling is Goong Pad Sator. See A Note on Thai Pronunciation and Spelling.